Belated Birthday Wishes for Boyfriend: Did you forget your boyfriend’s birthday? You must make it up by doing a lot more than writing a funny greeting for him. A sweet message or a romantic quote on a birthday card is definitely the right way to start your apology. Ask for forgiveness by showing how sad and remorseful you are for your innocent mistake. Tell him how your love for him is way more profound than remembering dates, whether it is his birthday or yours. Shower him with compliments and pamper him with cute hugs and kisses until he finally breaks into a smile to accept your late wishes. 1) I forgot your birthday, for which I am really sorry. I am weeping and sobbing, hoping you will forgive me. I made an honest mistake, I hope you can see. Please give me a hug – in your arms I want to be. Happy belated birthday. 2) Facebook, Snapchat, WordPress and Twitter. Instagram, Google Plus, LinkedIn and Flickr. All these networks I am going to use excessively, to give you my apology publicly. Happy belated birthday. 3) I am so sorry for being forgetful, I feel ugly from inside and so shameful. Please give me a hug to put me, out of this dreadful agony. Happy belated birthday. 4) I have been a bad girlfriend, I know. I want you to be angry at me, let your emotions show. Give me the harshest punishment, have no mercy. I am ready to suffer in pain, as long as you forgive me. I love you, happy belated birthday. 5) You have always been the prince of my life but since I forgot your birthday, you have officially become king for a month. Your wish is my command, Your Highness. Belated happy birthday. 6) I could write a quote about love and ask for your forgiveness. But instead, I want you to put your put your ears to my heart and listen to it cry. Happy belated birthday sweetheart. 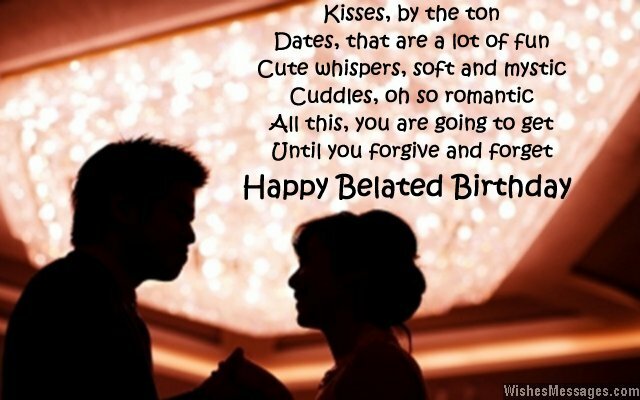 7) I have been so busy dreaming of you that I forgot your birthday. Please forgive this romantic mistake. Belated happy birthday. 8) This is your chance to get back at me and punish me all you want, but on one condition. All your punishments will begin with koala hugs and end with mushy kisses. Belated happy birthday. 9) I know you are feeling sad but so am I. I can feel how your heart is weeping but so is mine. I am sorry for forgetting your birthday but I want you to know that it hurts me as much as it hurts you. Happy belated birthday. 10) How angry you become at me for forgetting your birthday shows how much you love me. I am glad I forgot your birthday because now I know you love me a lot. Happy belated birthday. 11) With hurt and anger, I understand why you are exploding. But with sadness and guilt, I want you to understand how I am imploding. Sorry for not wishing you on your birthday. 12) I forgot my boyfriend’s birthday. I have made him upset in more than one way. I will punish myself until he sees how sorry I am. I will do everything to get our relationship out of this jam. Happy birthday. 13) I have given you wounds on your heart by forgetting your birthday. Now let me heal them by kissing them one by one. Happy belated birthday baby. 14) Until you forgive me my body will continue breathing but my soul will suffocate. I am sorry, happy belated birthday. 15) I remember the exact time and date of when we met, our first date, our first kiss, our first romantic hug and the first time we made out. Maybe I am so obsessed with remembering all these dates in our relationship that your birth date just slipped out of my mind. I am sorry. Happy belated birthday. 16) Kisses, by the ton. Dates that are a lot of fun. Cute whispers, soft and mystic. Cuddles, oh so romantic. All this, you are going to get – until you forgive and forget. Happy belated birthday. 17) You must tell me how bad you felt when I missed your birthday because I am going to give you that many number of kisses right now. Belated happy birthday. 18) I forgot my boyfriend’s birthday – a day which is more special to me than my own birthday. Such is the irony of my life. Happy belated birthday. 19) The most important day of the year is neither your birthday nor mine. The most important day of the year is the day we met, without which we wouldn’t be celebrating each other’s birthdays. Sorry and belated happy birthday. 20) Since I forgot your birthday, this card entitles you to hassle free forgiveness when you forget mine. I hope we are even. Happy birthday handsome. 21) You could have been angry at me, but you weren’t. You could have shouted at me, but you didn’t. You could have been bitter with me, but you weren’t. You could have ignored my phone calls, but you didn’t. Thanks for being so forgiving – you are the best boyfriend ever. 22) I did forget your birthday but I have never forgotten to say I love you. Now you tell me, which matters more? Happy belated birthday to my boyfriend. 23) Forgiveness is the most attractive facet of your personality. That’s why I fell in love with you in the first place. Prove my heart right and forgive me, please? Happy belated birthday. 24) You look hot when you are happy, hotter when you are angry and hottest when you are in a forgiving mood. I have made you angry but I want you to forgive me so you can be your hottest self. Belated happy birthday. 25) You must be secretly happy that I forgot your birthday. Because you know that I will go to any lengths to pamper you and make it up to you at any cost. Happy belated birthday. 26) By not getting angry at me for forgetting your birthday, you are giving me one more reason to love you. You don’t miss a chance to earn your brownie points, do you? Belated happy birthday, you sneakily handsome guy. 27) Others must have given you birthday wishes for one day. But I am going to treat you like a birthday boy every single day of this month. Happy belated birthday handsome. 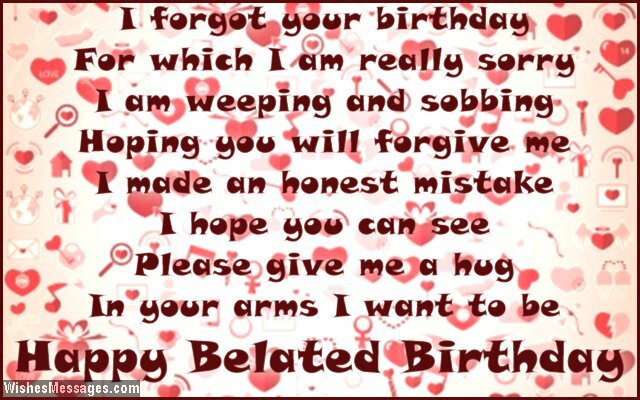 28) I am feeling so sad about missing your birthday that I have been crying since last night. There is only one thing that can make me stop crying – a kiss from you. Come here and kiss my sadness away. Belated happy birthday. 29) I forgot your birthday because you didn’t send me your wish list. Please forgive me and send me a list of all your wishes so I can make them come true one by one. Happy belated birthday. 30) I may have been weak in remembering your birthday but my feelings for you will always be the strongest. Belated happy birthday darling. 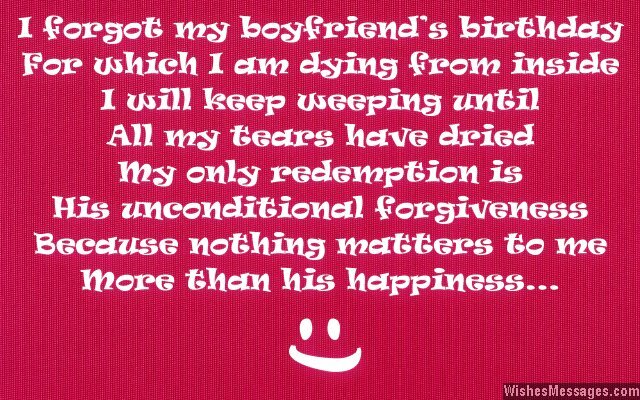 31) I forgot my boyfriend’s birthday for which I am dying from inside, I will keep weeping until all my tears have dried. My only redemption is his unconditional forgiveness, because nothing matters to me more than his happiness. Happy belated birthday. 32) For the next two months we are only going to watch the movies that you like, eat at the restaurants you like and hang out at the places you like. Let’s just say that you are going to be pampered silly until you finally forgive me for forgetting your birthday. 33) I deliberately forgot your birthday so that I could pamper you like a birthday boy for one more day. Happy belated birthday sweetheart. 34) I forgot your birthday but that doesn’t make you any less of a hot boyfriend. Sorry sweetheart. Happy belated birthday to the hottest guy alive. 35) Would you want a girlfriend who does not love you but never forgets to wish you on your birthday, or a girlfriend who loves you a lot and innocently forgets to wish you on your birthday just once in her whole life? Assuming you picked the second option, please forgive me. I love you, happy belated birthday. 36) I hope you can forgive me for forgetting your birthday just like how I keep forgiving you for forgetting to send me your compulsory quota of good night and good morning text messages all the time. Happy belated birthday sweetheart. 37) Your girlfriend cannot bear the pain of wishing you late on your birthday. She is requesting that you accept her apology, take her back into your arms, look into her eyes and give her a sweet kiss. Belated happy birthday. 38) Now that I have forgotten to wish you on your birthday, you get the upper hand in the relationship for the next one month. You can order me to do whatever you want. Belated happy birthday. 39) I enjoy our relationship so much that every day feels like a party and a celebration. Maybe that is why I momentarily forgot a day as special as your birthday. I am sorry, please forgive me. 40) If I forgot a friend’s birthday, I would be witty and write something funny to send my wishes. But since I have forgotten my boyfriend’s birthday I am going to keep it real, honest and genuine – I am sorry.